Can Yogurt Help to Get Rid of Diarrhea? Your gut houses approximately 10 trillion bacterial cells from 500 to 1,000 different species, according to a 2005 scientific review article in "Anaerobe" by Cynthia Sears, professor at the Johns Hopkins University School of Medicine. Many of these microorganisms work in tandem with your body to help it perform important physiological functions. Lactobacillus acidophilus is a species of bacteria that protects your body from disease-causing organisms. Although L. acidophilus is commonly found in yogurt, it is not a dairy product. L. acidophilus is considered a probiotic bacteria, meaning it has properties that inhibit growth of dangerous bacteria. L. acidophilus assists your body by breaking down food in your intestines. During this process, the bacteria release lactic acid, hydrogen peroxide and other substances that are toxic to disease-causing bacteria. These characteristics give L. acidophilus its probiotic properties. To make yogurt, milk is cultured with Lactobacillus bulgaricus and Streptococcus thermophilus, two different types of bacteria. 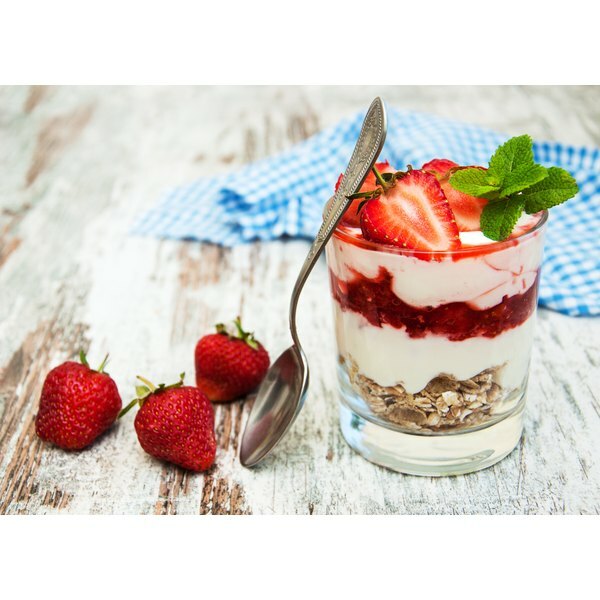 L. acidophilus is not used to culture yogurt and does not naturally occur in dairy products, according to the website Probiotics: Love That Bug. Some manufacturers add live L. acidophilus cultures to their yogurt because it has beneficial properties. These probiotic bacteria are also added to some brands of milk. Check the labels of your yogurt and milk to determine whether they contain live, active L. acidophilus cultures. People who are lactose intolerant or have dairy allergies cannot receive L. acidophilus through dairy products. Soy products often contain L. acidophilus cultures. Miso, a paste made from fermented soybeans that is commonly used in Japanese cooking, contains probiotic L. acidophilus bacteria. Tempeh, a type of soy product that originated in Indonesia, also contains L. acidophilus. Many health food stores sell L. acidophilus supplements. If you have a dairy intolerance, carefully check the labels to determine the supplement ingredients. Some L. acidophilus supplements do not contain milk sugars and are labeled lactose-free. These supplements, however, may contain milk proteins, which could trigger a dairy allergy. Dairy-free L. acidophilus supplements contain neither lactose nor other milk proteins. Supplements come in freeze-dried granules, freeze-dried capsules, freeze-dried powders and liquid preparations. Lawrence Adams' work has appeared in the "Marquette Literary Review" and "Broadview Press." He has a Bachelor of Arts from Marquette University in writing-intensity English and classical studies, with a minor in biology, and a Master of Arts in creative writing from the University of Illinois at Chicago. Does Activia Help With a Yeast Infection? Which Foods Replenish Good Bacteria in the Intestinal Tract?